Here in Saigon, the diversity is everything. People from all over the country gather in this city to look for the opportunity of fortune. 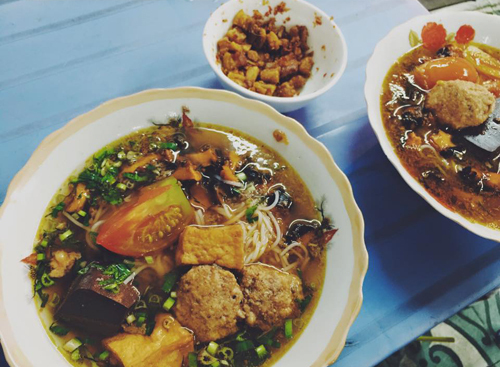 Many of them also brought along their customs, their way of life, and their culinary traditions make Saigon into a colorful and flavorful culture pot. Chicken curry is usually served with rice, noodles. 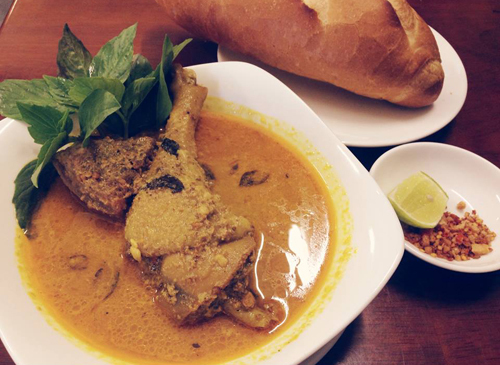 However, in Saigon, they serve curry with bread. 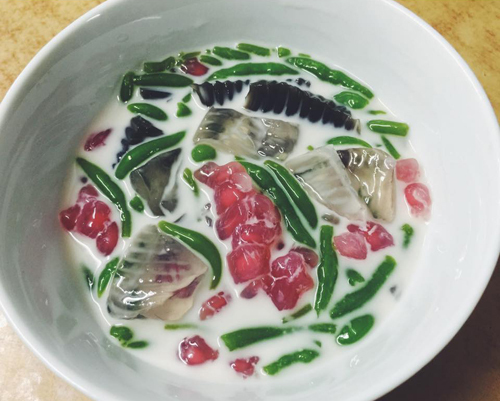 The dish has an extraordinary flavor from the mixture of ingredients like anise, cloves, curry leaves, chilies… However, the Vietnamese curry also has the coconut milk poured in to help increase the natural fatness and sweetness that are indescribable. 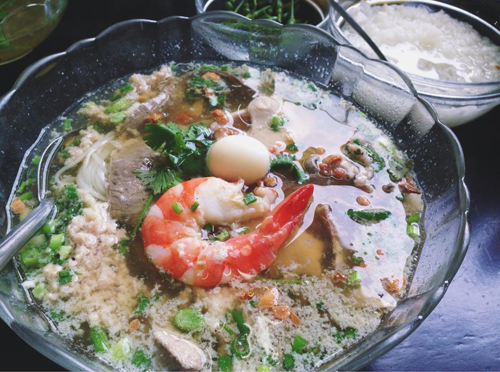 Hủ tiếu Nam Vang (Saigon Nam Vang noodles) is often eaten in the morning as breakfast or dinner. This is a heavy load for those who want a light breakfast, and this definitely not an in-bed breakfast. The bold flavor is from the extensive ingredients of the noodles. Minced pork mixed with sliced pork heart, liver, a quail egg, a shrimp are eaten along with herbs, namely sprouts and laksa leaves. The most important is the broth. You can have the “water noodle” with the broth or the “dry” with the broth separated. Each has its own distinguish flavors. 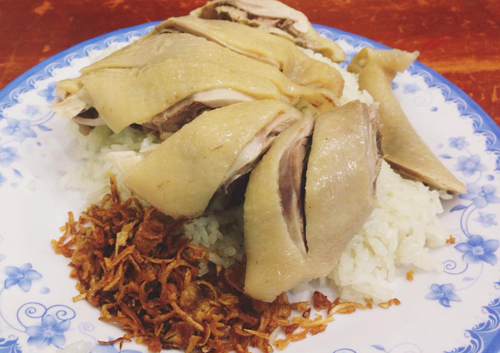 Chicken rice is also a famous dish from Saigon. First of all, the chicken has to be cooked perfectly because overcooked will make the chicken flabby and undercooked will make it dry. The secret is to use the chicken broth to cook the rice. This is so important because half of the flavor is from the broth. The extension is also important. The dish requires the fish sauce to dip the chicken. Bún đậu mắm tôm (literally Bean noodle with shrimp sauce) is a very bizarre, yet unique at the same time. 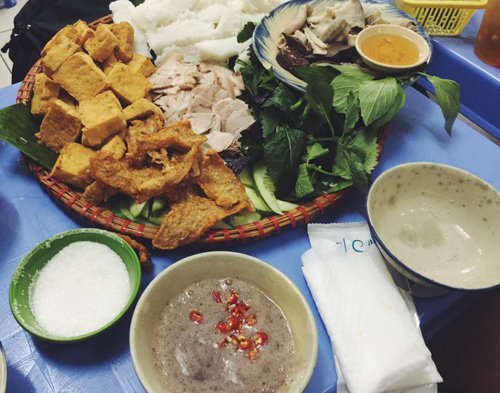 The dish has traveled a long way from the Northern regions of Vietnam to the heart of the South. The one thing about this dish is that it is strong in flavor and might not easy to eat. The plain noodle consists of noodle, fried beans, fried rice snack, boiled pork, and herbs… The most important that decides the success of the dish is the shrimp sauce. It is also a tank in flavor because of its powerful flavor. 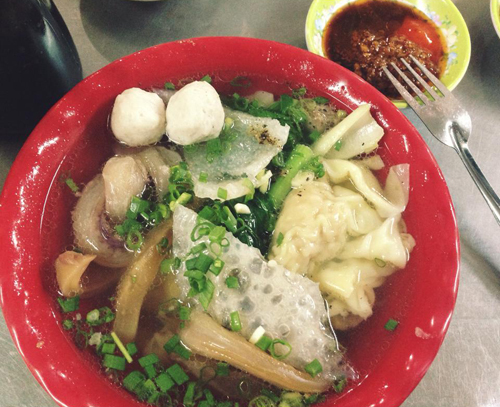 Wonton is the renowned dish of the Chinese community on the west side of the City, namely 5th District. The key when making the wonton is not to scratch the flour blanket outside wrapping the meat inside. The broth is also very important. However, there are so many ways you can prepare this dish. You can fry, boiled, and turn it into soup. It is your choice. Crab noodle may not the gentle dish, yet its chaotic flavors are quite irresistible. The dish consists of mill crab packed into roll-shape or block. The one bizarre ingredient is the boiled pila (a type of large freshwater snails with an operculum). To many, this is unpalatable. However, this is when the fun in flavors begins. The bowl of crab noodle also has boiled tomatoes, fried tofu, fried garlic, fried red onion, and cilantro. 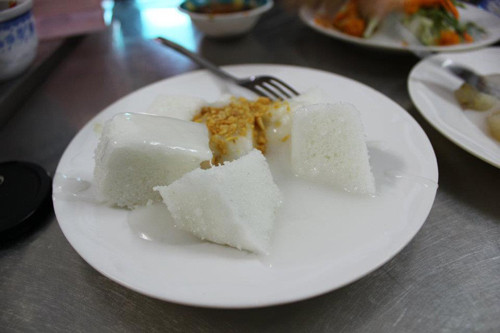 Bánh bò is a sweet, chewy sponge cake. It is made from rice flour, water, sugar, and yeast, and has a honeycomb-like appearance on the inside due to the presence of numerous small air bubbles. This is a perfect dessert, and also the right dish for those who love sweet. The cake is soft, and flavorful when eaten along with coconut milk and sesame on top. Chè (literally tea) is not the hot tea that you usually drink. In Vietnam, there are two types of tea. One is trà, or the drink tea and chè, or a kind of fresh dessert. The pronunciation will be different for some regions, but that is some other topic. The dish is made from jelly (a very special jelly), and pomegranate seeds, or many other types of fruit. The dish is perfect for a sunny day when you can add in some cube of ice. Chè is usually sold on the sidewalk where Saigon and easily mesmerized you.